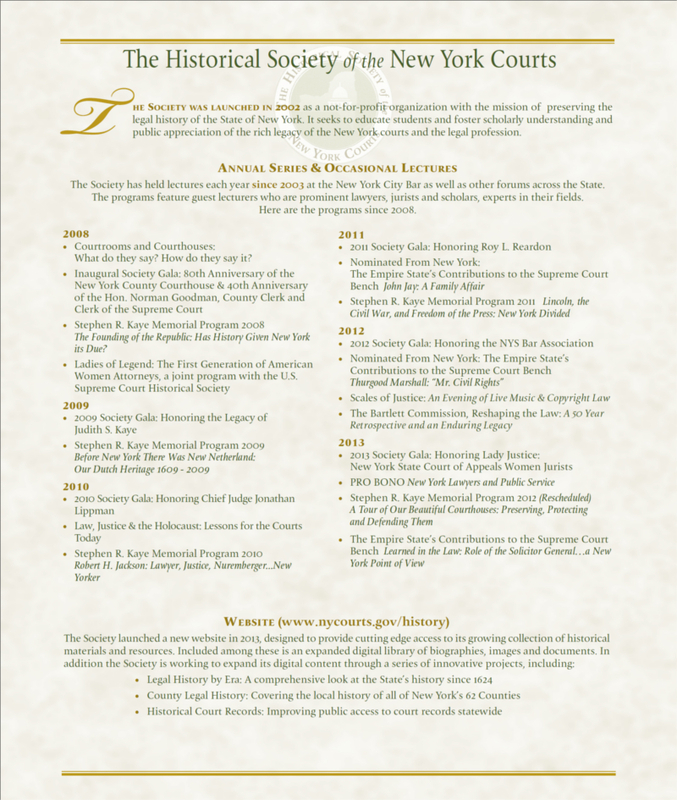 As the new century dawned, then-New York State Chief Judge Judith S. Kaye had the vision to create an organization that would collect and preserve this State's legal history. 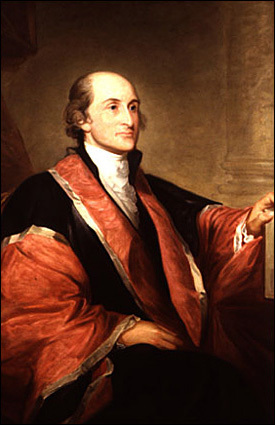 It would showcase the New York connection to our founding fathers and their contributions to the U.S. and New York State constitutions and the nation's developing democracy. It would breathe life into the history of our State's prominent legal figures, its rich legacy of court cases, and its magnificent courthouses. 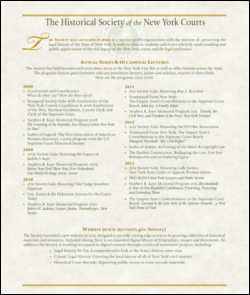 The Society was thus born, nurtured by a terrific partnership with Albert M. Rosenblatt, then an Associate Judge of the New York State Court of Appeals. 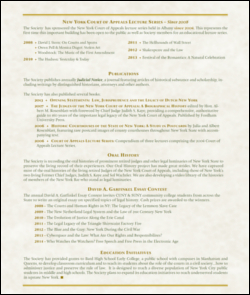 Judge Kaye recently reminisced about how, for her, the birth of this idea was linked to the 150th anniversary of the New York State Court of Appeals. She recalled how in 1996, as this important anniversary neared, she gazed at the portraits looking down at her in the courtroom and wanted to know more about each of the judges. She requested a list of her predecessors on the bench, with their dates of service, and was amazed to discover that none existed. Calling upon Frances Murray, the ever-resourceful Chief Legal Reference Attorney of the Court of Appeals, to look into this matter, Frances confirmed that the list was nonexistent. One day shortly thereafter, Judge Kaye arrived at her office to find a huge stack of photocopies that Frances had made of the inner front pages of each of the New York Official Reports since 1847. Each contained a record of the then-sitting Court of Appeals Judges for the period of that Report. From these photocopies a complete record of the Judges of the Court of Appeals from 1847 to 1997 was meticulously assembled. This newly minted list was included in a publication for the 150th anniversary celebration. 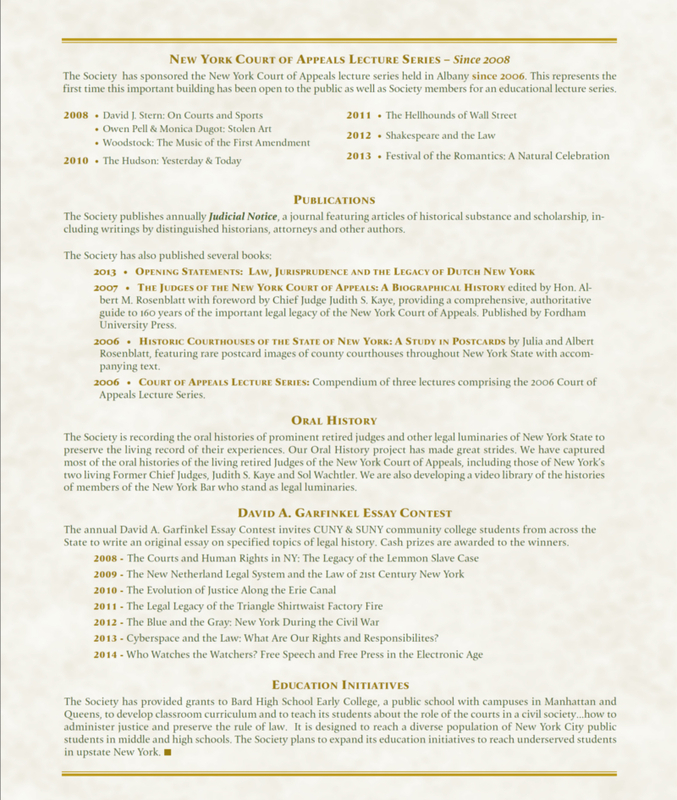 From that incident came the realization that New York State's court history needed to be preserved, and the idea was planted for the formation of a Society to do just that. Since that date, the Society has made Chief Judge Kaye's vision a reality through its various initiatives which are summarized below. Through our website we make available the rich library of research that has been collected, as well as the fruits of our many initiatives.